In English, it is a goo where bacteria can grow safely, where antibiotics have trouble penetrating. 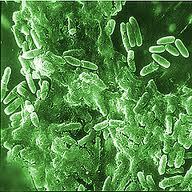 A biofilm is common, not something new. Not to gross out my readers, but dental plaque is a biofim. So is the hair ball in your drain. Just bacteria hanging out. If you are able to kill the outer layer of the biofilm, say with Drano, the interior of the biofilm is protected and continues to grow. For bacteria, forming this colony is a self-preservation or survival mechanism. It is difficult to remove because the bacteria form a matrix-like cover. A biofilm, made up of different bacterium and maybe some other bugs is difficult penetrate – with antibiotics, bleach or detergents. This entry was posted in Lyme Disease and tagged antibiotics, biofilm, bleach, Eva Sappi, Lyme, matrix, UNH, University New Haven. Bookmark the permalink.